If you or a loved one has been injured in a motorcycle accident you should know that motorcycle accidents are different than car and other injury accidents. You should know how motorcycle laws work and how they affect you and your case. Most attorneys require you to make an appointment in order to get some of the information that we have provided in our books. We believe that you should be able to have this information when you need it without any pressure. We want you to have the information you need before you decide if you need an attorney for your case. How does a motorcycle accident differ from other injury accidents? Should I provide a recorded statement or signs forms for the insurance adjustor? What if the other driver does not have enough insurance to cover my injuries? What is the best way to have my medical bills paid to put more money in my pocket? For the answers to these questions, 9 Insider's Secrets to keep your case on 2 wheels and much, much more order this FREE book to learn your rights and responsibilities. Why offer a Free Book? For more than 25 years Iowa Personal Injury Attorneys Corey Walker and Erik Bair have represented hundreds of injured Iowans including many injured in motorcycle accidents. They have seen too many clients make mistakes before they had the "right" information resulting in them losing thousands of dollars. 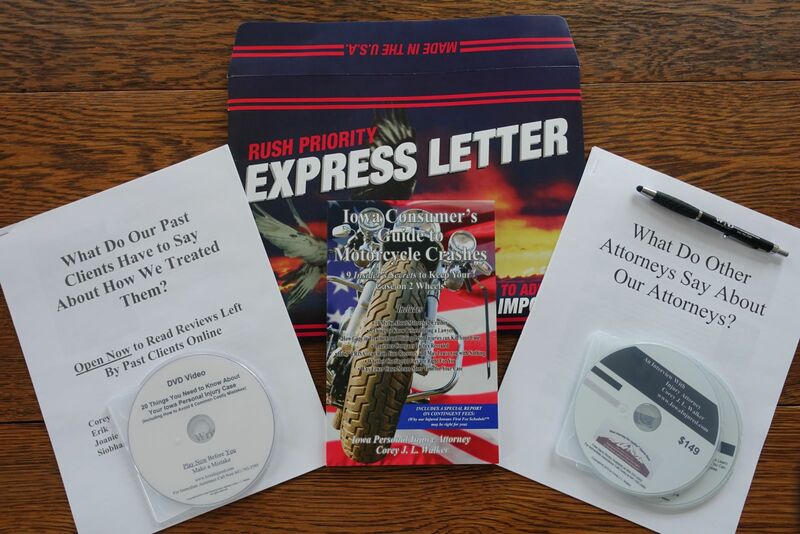 Finally, you can learn about motorcycle accidents in the comfort of your own home with no risk or obligation. Request your copy of our book now while supplies last. Simply provide us with your name, address, etc. below or call our toll free recorded message at (800)-707-2552, ext. 815. Our Guarantee to You: We are so confident that our book will help educate you that if you do not learn at least one thing, let us know and we will donate $1,000 to your charity of choice.